Just days after swimming across the English Channel, quadruple amputee Philippe Croizon (pictured) is already dreaming of a new challenge: crossing from Europe to Africa in the Strait of Gibraltar. Croizon, who swims using leg prostheses with fins attached, also has an inspirational message for anyone discouraged or facing difficulties. 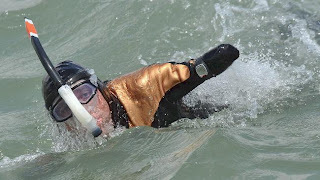 "You only need to want (something), and then it becomes possible to go beyond your limits," he told Associated Press Television News on Monday, two days after crossing the English Channel, which is 21 miles (34 kilometers) at its narrowest point. Croizon, 42, had expected his weekend swim from Britain to France to take up to 24 hours. Instead, he reached the cliffs of Wissant in northern France on Saturday night after only 13 and a half hours. He uses specially designed leg protheses, which end in fins, to propel himself through the water. His truncated upper arms go through the motions of the crawl, and he breathes through a snorkel. Upon reaching the French shore, a wave threw him into the rocks, before being pulled out of the water. "The guys on the boat were shouting, 'Get out of there!' The waves were huge," Croizon recalled. Then he saw his two sons up on the cliff above, cheering him on. "I broke down in tears ... it (was) pure happiness," he said. The swimmer's arms and legs were amputated after he suffered an electric shock in 1994 as he stood on a ladder adjusting his television antenna, which touched a power line. While he was recovering, he saw a news report about an English Channel crossing. "I watched the TV screen and said to myself, 'Why not me?'" he said. "So 16 years later, the 'why not me' became a reality here." He added: "I can't even realize it myself, it's crazy!" Croizon said he hopes to be able to cross the Strait of Gibraltar between Spain and Morocco, perhaps in a year or two after more training to adapt to the different conditions there. While the strait, at about 14 kilometers (9 miles) at its shortest point, is shorter than the English Channel, it has busy traffic and strong currents. He said the main message of his cross-Channel endeavor is that "we can all make it." "We all have it in ourselves but it is well hidden, in our daily routine," he said. "When a big problem occurs, we can still pick ourselves up. If I can show other people that life is not only suffering, I would be happy. We suffer, but we get back up again."